Colorful Cape Town is one of the Rainbow Nation’s three capital cities, and the departure point for your immersive voyage to explore South Africa. 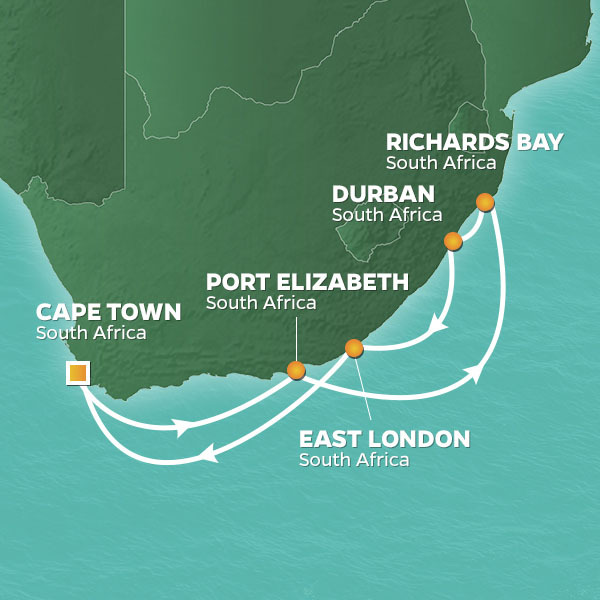 Don’t worry if you don’t get to explore a lot before you embark, we’ll be back to really see what Cape Town is all about after we call on four other South African ports. In Port Elizabeth, embrace the sense of community (known locally as ubuntu) at a bustling market or at a local pub before embarking on a once-in-a-lifetime animal encounter at Addo Elephant Park. After a day at sea sailing along the South African coast, we arrive in Richards Bay. It’s a gateway to thrilling safari excursions inland, where you’ll discover sprawling wilderness, rolling hills, and exotic wildlife. The Indian-influenced city of Durban is up next. Wind your way past Victorian architecture and ornate mosques, stroll along the Golden Mile beach boardwalk, or venture outside the city to see the breathtaking Valley of 1,000 Hills. At the river port of East London, discover the only known dodo bird egg in the world, as well as other prehistoric beasts. Couldn’t get enough of Cape Town? This South African country-intensive voyage returns for two nights so you can get your fill of this fabulous city. A trip out to the Cape Winelands is a must, and you can’t pass up the chance to dip your toes in two oceans at the same time. Please Note: Transfers from airport to pier and back are not included as it is not yet available to book. 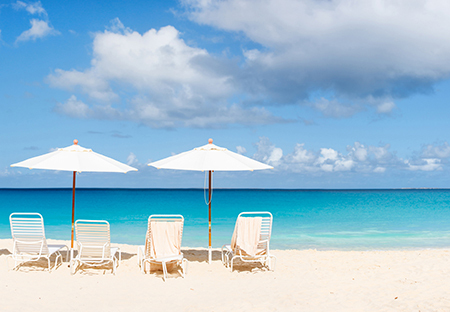 Book by May 31: Exclusive $650 USD per cabin on board credit! Promotion may be withdrawn at anytime. Experience the Rainbow Nation with our South Africa cruises to Port Elizabeth. With a warm climate, beautiful wide beaches, and spirited communities embracing cultures from all over the world, it’s little wonder Port Elizabeth is known as “The Friendly City.” Discover the Port’s storied history while walking the Donkin Heritage Trail, dig your toes in the sand at beautiful Hobie Beach, or escape to the animal sanctuary of Addo Elephant National Park—home to the densest population of elephants in the world. Experience South Africa’s rugged coastline, pristine beaches, and mist-covered hills. Richards Bay is perched on a lagoon where the Mhlatuze River meets the Indian Ocean, and is the gateway to Zululand, the vast inland region famous for its mountains, savannah ecosystems, and the Hluhluwe-iMfolozi Park—home to the largest white rhino population on Earth. Nestled between the Buffalo and Nahoon Rivers, East London’s charming 19th-century architecture and vibrant cultural scene are a gateway to breathtaking wildlife safaris and the Amatola Mountains inland. Cruises to South Africa’s East London are ideal to explore both the Sunshine Coast to the south, and Wild Coast to the north, where miles of sweeping white sand and dunes mix with warm, golden sun on some of the world’s finest beaches.